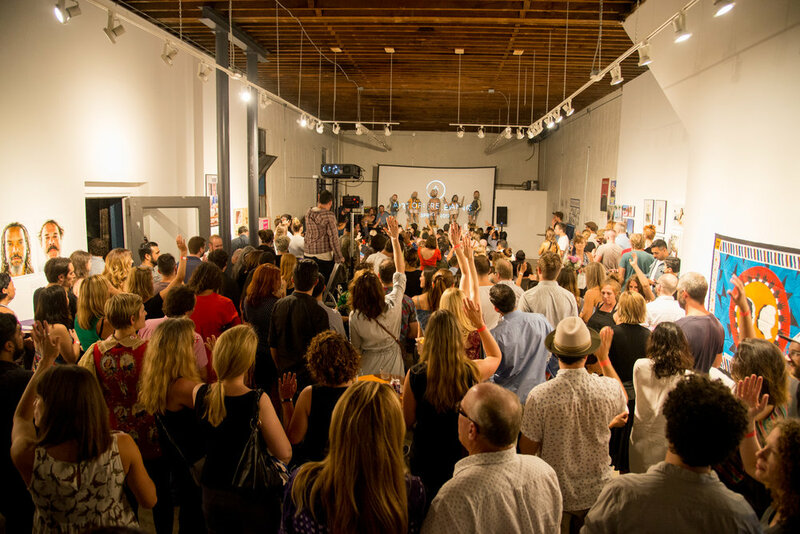 The Art of Freelance Showcase is an incredible free public event meant to celebrate, showcase and connect our Art of Freelance Alumni to the greater Los Angeles creative community, and industry leaders looking for new freelance talent. We have hosted them mostly in the Downtown Los Angeles Arts District, and they have included food vendors, free beer and wine, great music, and great crowds. Our last event was attended by over 350 people. 1. The Gallery: New work by AF Members is hanging on all the walls, displayed on laptops, and built as installations around the venue. The venue opens early for the audience to walk around, view the work, and talk to the creatives. All Members who wish to present in the Gallery are able, provided they follow the simple application instructions leading up to the event. 2. The Presentations: For a 1-hour block in the middle of the event the audience sits and watches presentations from selected Members on the big screen. The creatives have an opportunity to introduce the work from the podium and/or talk about it during their presentation. We are not able to accommodate every Member who wants to present on stage, and there is an short application process to be selected to present. Is attendance required? / Can I still present if I’m not in attendance? Attendance is celebrated but not required. Art of Freelance headquarters is based out of Los Angeles, however, we are a global community and therefore know that not everyone can be physically present. You can, however, still present even if you are not in attendance. We have had past members send us materials for their presentations in both digital and physical form. We have also had Members video call in on the big screen during the presentation hour from Bali, Tanzania, and New York. Remote presentations must be planned in advance, but anything is possible! What is the venue / gallery space like? This session’s venue is TBD, but we will send specs as soon as we have them. In the past we have rented an Art Gallery in the DTLA Arts District. The Showcase is typically 7 - 11p PST. Static vs. Stage Presentations - do I have to choose one? Everyone will have the opportunity to present in the Gallery, either with a physical presentation (wall mounted, no more than 4x8’), a digital presentation (on a laptop or other monitor), or a physical installation (non-wall mounted, by approval only). Everyone will have the opportunity to apply to present on the big screen during the Presentation hour. A simple application will be sent out with instructions closer to the event. Those presenting on the big screen will also have the opportunity to set up in the Gallery as well. Do I have to present? What if I haven't finished my project? 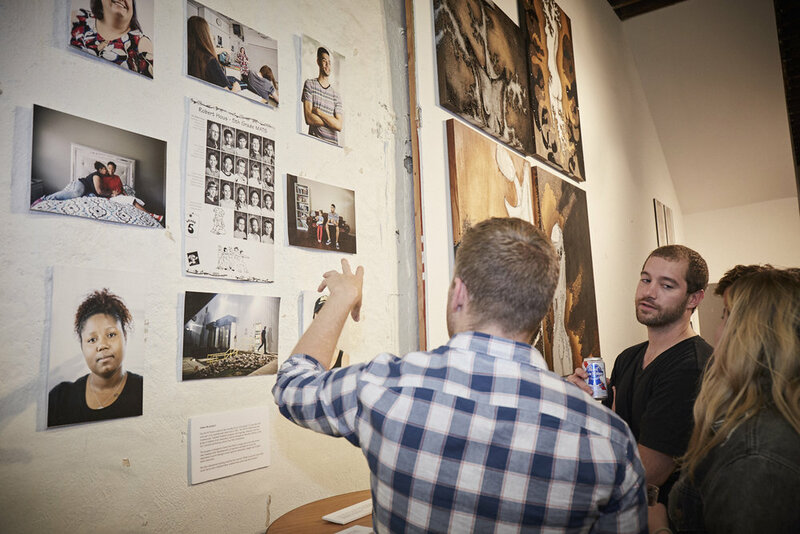 We consider presenting your work at the Showcase, in one format or another, to be “graduating” from the Course. We encourage you to present, even if it’s a work in progress. We believe in “Progress > Perfection” and that there are benefits to showing up and showing your work. New collaborators, great feedback, and new inspirations are all possible. Plus, having the deadline of the Showcase can really help you push to get amazing things done during the Course. Anything that will fit in a 4x8' wall space - Use your imagination; we have had paintings, photographs, posters, etc. Just make sure your work will fit! Any digital pieces (i.e. websites, reels, films) that you display on your own laptop or monitor (don’t forget the charger!). A stand alone installation - A few exceptions are made for those that want to do installations but these must be cleared as early as possible. Wall space - The wall will be your backdrop for anything you choose to hang. Mounting supplies + tools - We will have a hammer and nails, a drill, mounting tape. If you have an idea for a Gallery presentation that isn’t going to fit into this format, please reach out as early as possible so we can brainstorm on how to make it work. The stage presentations allow a curated group of AF Members to each make a 3 minute presentation of their work on the big screen in front of the entire gallery. We have seen short films, photo series, power points of the work created, readings from books and plays, a fashion show, musical performances, kickstarter videos, and many more. How many people get to present on stage and how is it decided? We curate these presentations based on the descriptions provided by the Members, as well as feedback by the Guides. 1. Submit a 3-min script. Start by briefly introducing yourself and your experience with Art of Freelance. For those of you who are not performing a set song or script, we recommend rooting your performance in terms of your personal story, why you made this work and your process in creating it. You only have 3 minutes total on stage. Please time your presentation now and edit as needed. We’re sticklers about this! 2. Decide and let us know if you’ll be using a static background image or a slideshow to accompany your performance. The best performances have a visual component projected behind the performer on screen. Some have had a slideshow (there is no remote, so you’d have to prompt slide changes in your script) and others have just projected one image behind them to set the scene. 3. Let us know what your setup looks like and if you need any special equipment. Anything needed not mentioned below needs to be discussed well in advance. We are a small team putting these events together, and will not be able to accommodate last minute requests. Can't wait to see you all and your incredible work on January 20th!